Bill MacGregor and Janice Hogan are the vice president and coordinator of the Citizens Technical Environmental Committee in Butte, seen in this photo from June 6, 2018. She moved back for good in the 1980s, right around the time that Butte was declared a Superfund site. Over a century of mining and smelting left the city’s soil and water badly contaminated with heavy metals and toxic mine waste, and the Environmental Protection Agency moved in to help clean it all up. That cleanup has been ongoing for the last 35 years. But Richardson’s still not convinced her health is protected. That’s why she only drinks bottled water. 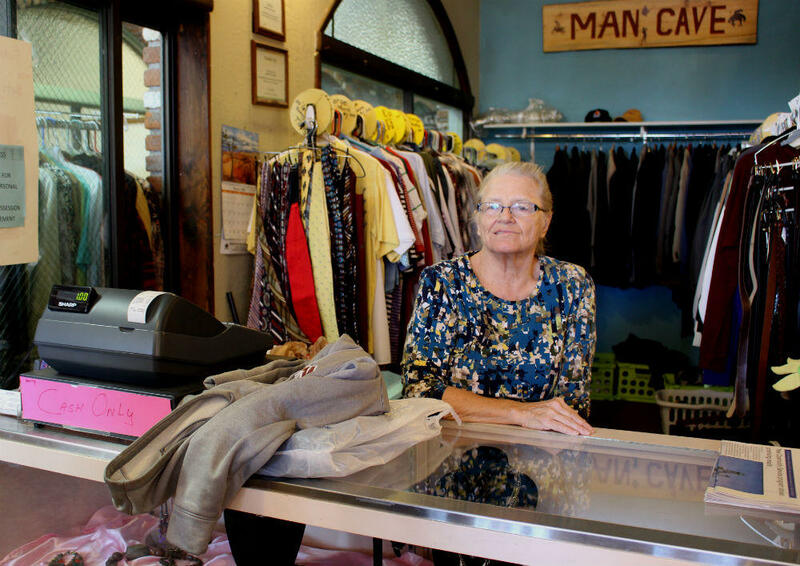 Billie Richardson, program director of Suited for Success, a non-profit thrift store in Uptown Butte, pictured September 4, 2018. "I just don’t do Butte water. I use it to wash my clothes and take a bath in and shower in and all that kind of stuff. And I even cook with it. But I don’t drink it," says Richardson. When asked why she doesn’t think it’s safe, Richardson said, "there’s a lot of metals and things that are in the water that have come from underground mining or from the Pit. You know? And how do they go about sorting through all of that and making sure that it is pure enough for people to drink?" Since the 1890s, Butte’s drinking water has come not from underground sources in or near the city, but from the Big Hole River and two mountain reservoirs that are miles away from mining activities. And the county recently built a state-of-the-art water treatment facility with Superfund settlement restoration dollars. Richardson knows about the new plant at Basin Creek Reservoir, but still has her doubts. Asked if there is anything that Butte-Silver Bow could communicate to her about the safety of her water that would reassure her and that would make her would feel good about drinking it, Richardson responded, "Well it’s pretty hard to teach an old dog new tricks." And, Richardson is pretty informed. Right across from her thrift shop is the Citizens Technical Environmental Committee office. CTEC is the local group charged with helping the general public understand the complexities of the Superfund process and cleanup. She stops in often to chat with staff and to ask when the Superfund cleanup is going to start. Richardson’s views are hardly unusual in Butte, but they’re still striking to CTEC’s Vice President Bill MacGregor, who’s a retired professor of technical communication from Montana Tech. He’s watched the community’s response to the Superfund cleanup and the agencies in charge evolve over decades. MacGregor says on the one hand, "You’ve got documented evidence of massive changes in the environment. Both in terms of the surface and the water, and the subsurface, all sorts of of work has been done. Hundreds of millions of dollars of work has been done." He's sitting in the CTEC office, wreathed by evidence of that work. There are dramatic photos of old mine yards and waste dumps before and after the cleanup. Binders of reports on the 1,000 plus yards and attics that have been remediated for heavy metals, and the population’s declining blood lead levels. Diagrams of the Berkeley Pit, showing why it can’t overflow. And yet, MacGregor says, "You get people wondering, well I see that, but can I believe it? Can I trust it?" MacGregor says over and over in Butte, you hear locals express grave concerns about their health and their future. Not just about drinking water, but whether it’s safe to live in their house, or plant a garden. And the refrain of, ‘when is the Pit going to overflow?’. So despite these documented environmental cleanup achievements, MacGregor says, “You still have these concerns, experiences that are at odds, very often at odds, sometimes just literally in opposition." A lot of people seem to perceive a high level of environmental health risk in Butte. A persistent culture of doubt remains. And MacGregor really wants to find out why. So CTEC is branching out. In July, they got a federal grant to partner with researchers at Montana Tech to study first, if such a disconnect exists, and if it does, to characterize and measure that gap. MacGregor says this new pilot project is "Not about hammering at the agencies for doing a lousy job of communicating. There’s lots of information out there. And it’s not about defending what they’ve done either. It’s about finding out why is there this gap and what can you do when you discover that the messages you’re sending out and the work that you’ve done isn’t perceived as being protective?" The research team received about $60,000 from the National Institutes of Health to launch the study. They’ll build a historical record of cleanup actions and public perceptions, and then conduct community surveys and focus groups. "At some gut level, I guess I would have to say my instinct says that a lot of the doubts, a lot of the problems with this gap, arise from the ebb and flow of trust," says MacGregor. And if that ends up being true, Dr. Maureen Lichtveld says that could be tough to overcome. Dr. Lichtveld is an environmental health scientist at Tulane University with over 35 years of experience in the field, including studying the effect of the BP oil spill in the Gulf on vulnerable communities. She’s spent more than a decade working on health studies and risk communication at Superfund sites across the country. And she says it’s inherently hard both for agencies to communicate the environmental health risks to communities living near hazardous waste sites and hard for locals to accept them. There are number of reasons for that. "Critical here is that people accept risks that are voluntary much better than risks that are imposed," Dr. Lichtveld says. "And this is an imposed risk, clearly." Dr. Lichtveld says people also tend to be more accepting of risks when they’re in control of taking action to reduce them, and when they’re tangible and known — you can see, touch, taste or smell them. That’s not usually the case at Superfund sites. And there are other, unrelated health challenges and stressors in a community that complicate these underlying factors. "All of those taint the fear for risk and the perception of the risk that exists," Dr. Lichtveld says. "There’s no science behind how to make those go away. The best way to make those go away is to create trust." That may sound fluffy, but Dr. Lichtveld says what it means is actually pretty straightforward. She says "it is a longstanding commitment where you involve the community early and throughout. Not at the end. Not at the beginning. But early at the design and throughout each step of the process, whatever that process is." That’s a big challenge in Butte, where the Superfund process started 35 years ago, and trust in the agency has waxed and waned for various reasons, making it hard for locals to accept the findings and solutions coming from regulatory agencies. And without that acceptance, and the support of the state, EPA can’t call the cleanup a success, no matter how many millions of dollars are spent. But she says having evidence, "that their concerns have been treated with the same level of seriousness as an environmental media assessment or a health assessment, I think that goes a long way towards acceptance." Dr. Lichtveld says CTEC and Montana Tech’s new research collaboration is a step in that direction, but has limitations. While it gives more voice to community members, it leaves out other key parties to the cleanup, like EPA, local and state agencies, and Atlantic Richfield. But Bill MacGregor, with CTEC, is hopeful that their results will inform the other agency-led Superfund health studies going on in Butte right now and contribute what’s so often left out: what people see, feel and experience around their health here. "I would be overjoyed to learn that the hypothesis is maybe overblown," says MacGregor. "That lots and lots of people understand what’s been going on and they just don’t comment. They don’t talk about it. They know. That would be wonderful. I don’t think we’ll find that." CTEC and Montana Tech plan to start surveying people about environmental health in Butte this fall. This report was funded in part by a grant from the Montana Healthcare Foundation.